I feel it is my duty to inform you that the purveyor of one of your daily deals is providing less than the level of service it advertises. In fact, I would go so far as to say this business is approaching fraud in the way it conducts itself. Since your service is by far my favorite online provider of belly-dance lessons, permanent eyebrow tattoos, and discounted meals at obscure area restaurants, it seems to me you would appreciate being informed when one of your participating vendors is giving your reputation a black eye by association. Allow me to briefly lay out my story in hopes that others may be spared my experience. It began, as most visits to my inbox do, with a new Groupon email. By the way, the frequency and inevitability of receiving your offerings is on a par with that of the Valu-Pak mailers that arrive in my mailbox and are similarly brimming with relevant local deals, and I thank you for that. I scrolled past the romantic getaway to Houston and the BYOB crockery-painting class - there are only so many weekend trips and drunken art studios one can fit in, no matter how delightful - but I stopped when I saw the deal for "mole removal." The abstract graphic representation of the mole was intriguing. This was a real stroke of good fortune for me. With the onset of Spring gardening season, I've found myself battling these pesky critters in my yard, where they root and dig and generally make a mess of my lovingly-planted flower beds. Also, while their blind shuffling about is undeniably adorable, they've bumped into my patio support columns so often that I fear they're becoming structurally unsound (the columns, not the moles). And so I jumped at the opportunity to have up to three moles removed for the astonishingly low price of just $39 (a $350 value). They're only cute if they belong to someone else. When I contacted the featured business, the representative was initially very polite and friendly. She asked me about the moles I wanted removed, and I said they were the standard variety - small, hairy, and generally obnoxious. She said she understood completely and promised their removal would be discreet and painless. This I appreciated very much; there's no shame in having a garden plagued by varmints, but there's no need for the neighbors to know, and really no call to visit cruelty upon them. We're all God's creatures. We set up a date and time for an initial consultation, which I thought was very thorough. Unfortunately, the representative failed to arrive, even though I waited at home the entire day, during which time I personally witnessed the moles having their way with my succulents. I called the business to inquire whether there had been some miscommunication regarding our appointment. I was then informed that it was in fact I who had failed to show up at the arranged time. I was incredulous. Do you mean to tell me, I asked, that you expect me to bring the moles to you? Upon which I was told that the business does not make house calls, and would I like to reschedule my appointment. At this point I'm afraid I became quite flustered. Trying to keep my voice calm and reasonable, I asked, If I'm paying you $39 to have my moles removed, yet I'm required to catch, cage, and transport them to your establishment myself, what exactly am I paying for? 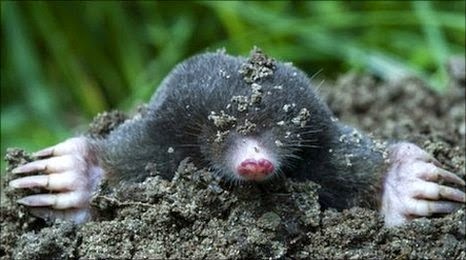 What will you do upon taking possession of the moles that constitutes "removal" beyond what I've accomplished on my own? There was a long pause on the line, and then the representative rather timidly explained some procedure involving lasers. Lasers?! Good Lord, I want the beasts humanely relocated, not subjected to spy-grade weaponry. I told the representative I would prefer to try traps, loud noises, or perhaps spreading a mild pesticide on the affected areas. She hung up on me. Is this the kind of negative customer service experience Groupon wishes its clients to have? If so, then you should continue to offer deals from this business, because my experience has left me wanting no part of this particular operation. I believe I've wasted my time and money, and I still have the problem of voracious rodents among my plants. I really feel this company has no expertise in the service it claims to provide. Frankly, I'm baffled that it chose to advertise on Groupon at all, or that you agreed to let it do so without making some attempt to ascertain that it could deliver on the promise of low-cost, effective pest control. If it is at all possible, I would like a refund of my $39. Under separate cover, I will lodge a complaint against another of your advertising businesses, which claimed to offer "custom framing" yet refused to arrange for my abrasive neighbor to be falsely accused of any crime at all, let alone one tailored to my specifications. This apparent pattern of disappointing Groupon deals is worrying to me, as it should be to you. Squeak! We moles are insectivores, not rodents. Squeak! By the way, I Google Plussed this article. I was hyperventilating laughing at it. For more than twenty years I've thought Jasper Carrott's mole story would be the funniest thing I'd ever hear or read on the subject of moles. Nothing is ever certain or fixed, though, and now it's tied for first. It reminds me..sooner or later I need to write a story about my laser hair removal fiasco (I bought it from Groupon as well) It ended with some permanent scarring and I still have a mustache. I wish they'd offer that in my area - I have two that need to go. More, actually. At least four, now that I think about it. But noooooo, I just get hair removal. Or was it hare removal?